Town Business: Did OPOA Gut Oakland's Police Commission? Last Friday, the Oakland City Council convened a special closed session meeting to secretly debate what powers a proposed civilian police commission should or shouldn't have. 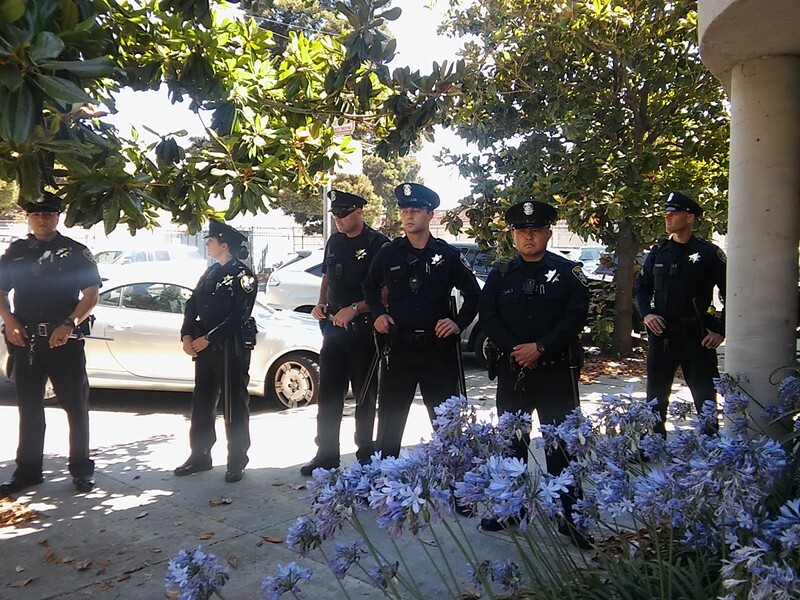 As Robert Gammon of Oakland Magazine observed, the conclave happened because the Oakland Police Officers Association has threatened to sue the city council to prevent them from placing a measure on the ballot that would overhaul the existing police discipline process. So what made it out of last Friday's meeting? What's going to be voted on at this Tuesday's special council meeting? Did the police union really succeed in "gutting" the police commission? Here's some highlights of the most recent version of the police commission ballot measure drafted by Dan Kalb and Noel Gallo, posted as of last night on the city's web site. Contrary to what activists with the Coalition for Police Accountability want, the mayor will be able to directly appoint three commissioners to the police commission. The other four will be appointed by a "selection panel" of Oakland residents who themselves are picked by the council and mayor. Similarly, the city administrator will get to hire the head of the police commission's investigative agency from a short-list provided by the commission. The administrator also picks a staff person who provides administrative support to the commission. Some have criticized giving the mayor and administrator these roles because they could be used as a means of influencing the commission. Reformers say these powers will inevitably politicize the agency's investigations and the commission's decisions. Oakland Mayor Libby Schaaf said in a written statement, however, that allowing the mayor to directly appoint commissioners is appropriate. "The Mayor is the most directly accountable official to the people," Schaaf said in a statement issued today. "It is a well-constructed composition with appropriate checks and balances. The appointments must each be confirmed by the City Council and always are a minority. The majority are appointed by an independent board. Appointees may not be removed and must meet certain qualifications, thus are unlikely to be subject to political influence." Struck from the current legislative text is a proposal that would have made the commission's legal counsel a deputy city attorney. Rather than have legal counsel that reports to the city attorney, the commission will have its own independent attorney. The Coalition for Police Accountability has lobbied hard for making the commission independent of the city attorney, so this is a win for the reformers. commission, would be subject to penalties under state law. But while the commission would have the same access to all OPD records as department's own internal affairs division, there's one big exception. The commissioners and their investigators won't have access to cop's personnel records. Instead, only the head of the commission's investigative agency will be able to access personnel files. Given this limitation, it's not clear how thorough investigations of police misconduct will be. The Coalition for Police Accountability has advocated giving the commission an unrestricted ability to accept or reject OPD's policies, but for anything that falls outside the scope of use of force, profiling, and 1st Amendment assemblies, the commission would only have the ability to review and comment. The original version of the Kalb-Gallo measure would also have put a civilian in charge of OPD's Office of Inspector General, and moved the OIG under the commission's supervision. The OIG conducts audits of OPD's programs and policies, and civilianizing the job was seen as a way of making sure the audits are independent and rigorous, but it looks like this won't come to pass. The current text has this section entirely deleted. One power the commission will still have, even after all OPOA's threats, and despite pressure from other city officials, is that it will be able to unilaterally fire the police chief with a vote of five of the seven commissioners. Of course there's likely to be even more last minute amendments at Tuesday night's city council meeting. And of course, changing the existing system of police discipline is completely off the table. 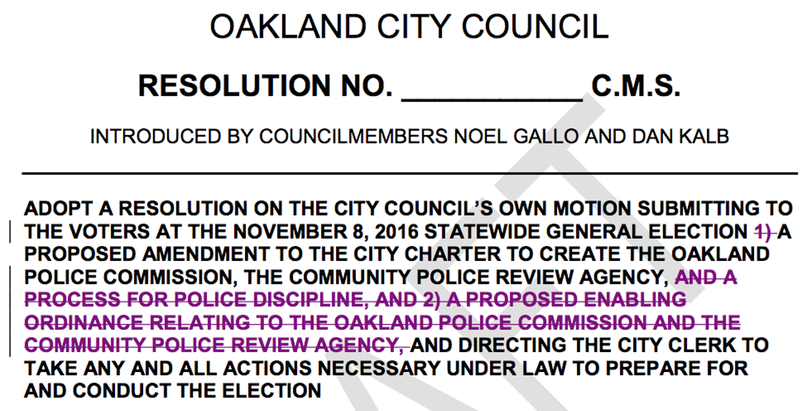 Oakland cops will continue to be able to contest discipline through binding arbitration. But as of this morning this is the police accountability legislation that will be on the November ballot. Editor's note: this story was updated to include a comment from Mayor Libby Schaaf on the issue of allowing the mayor to make direct appointments to the police commission.